Risk aversion at Lehman levels, but are we heading there? New Delhi: Nick Paulson-Ellis, Country Head (India) at Espirito Santo Securities has an interesting suggestion for investors who fear a meltdown in global financial year system. He suggests buying a ‘log cabin, some gold and a lot of tinned food.’ But for more optimistic souls, who see a painful period of economic recovery in developed world, he recommends giving Indian equities a chance. “Yes it is slowing down, but we’re still talking about 7.5% GDP growth and 22% y-o-y revenue growth in Q1FY12 (29% if you include energy stocks)," Ellison says in a strategy note. But a Credit Suisse study finds that investors have become more pessimistic. According to researchers there, the risk aversion in domestic market has hit levels that were last seen after Lehman collapsed. In order to separate ‘de-rating’ and ‘de-risking’ of the market, we derived a risk index which is independent of market valuation levels. We filtered out the de-rating component, we found that risk aversion is currently at levels similar to that of the ‘Lehman moment’. Figure (below) indicates that risk appetite in the market is very low at the moment, and further de-risking seems less likely. Risk appetite has been lower than the current value only for two months in the last five years. One cannot for sure say that further correction won’t happen, but the sharp fall in valuations is tilting the risk reward ratio in favor of equities. 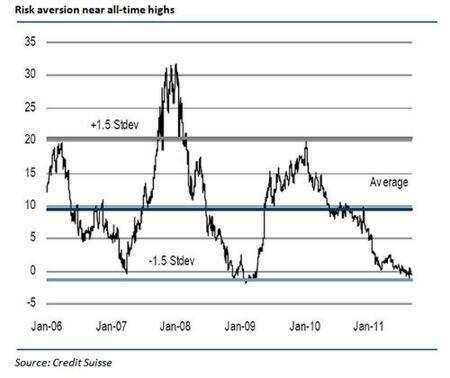 According to Credit Suisse, the risk adjusted relative valuations have hit lowest levels in eight years (barring of course the Lehman months). With a Lehman-like financial meltdown not guaranteed to happen (giving a benefit of doubt), Credit Suisse analysts feel that the current valuations provide more of an opportunity than otherwise. In the last eight years the Risk-adjusted Relative Valuation (RRV) has only been out of the ±1.5 standard deviation range 12% of the time. The current read is at the lower bound of this range – it has only been lower in the October 2008 to May 2009 period. While the benchmark indices in the domestic market are yet to hit the March 2009 lows, on the valuations and risk-reward front, they are favorably placed. However, with the debt contagion in the Euro region still unfolding, it will be a difficult call investment call to make.